Tea is a plant which belongs to the camellia family and the botanical name is Camellia Sinensis (L) O. Kuntze. 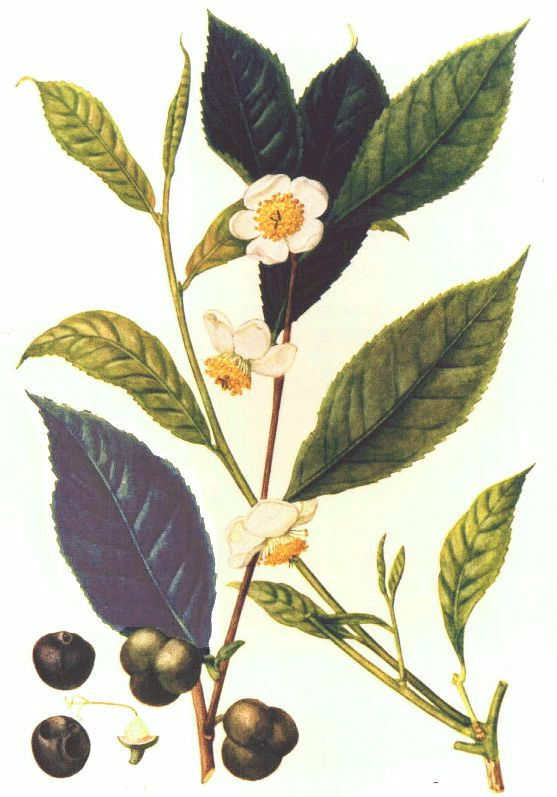 The tea plant is a flowering evergreen shrub. From May on the plant blossoms with small, white, creamy or pink coloured flowers. Later in the year, they become small spherical fruits with three seeds in the wooden shell (see picture to the right). sinensis var. sinensis (South West China) and sinensis var. assamica (Assam, North East India). Every cup we drink today comes from a tea cultivar. These varieties are engineered to suit certain growing conditions and climates as well as to optimise the desired type of tea produced. China tea bushes (var. sinensis) can grow up to four meters high, with small leaves (2-6cm) and have a fine-aromatic flavour. Sinensis cultivars are mainly used to produce green, white and Oolongs teas but also some black varieties like our Keemun Superior. The bush is cold/frost resistant and can grow in mountain terrain up to 2000 metres. The Assam variety was only discovered by Europeans between 1823-25. It is a tropical tree (15-20 metres), grows quicker and has bigger leaves than the Chinese variety (10-20 cm, see image below). The flavour is rich and hearty and therefore mostly used to produce black teas. Similar to the production of wine, the taste and quality of tea are influenced by many contributory factors: climate, soil, altitude, weather conditions, when it is plucked and how it is processed. 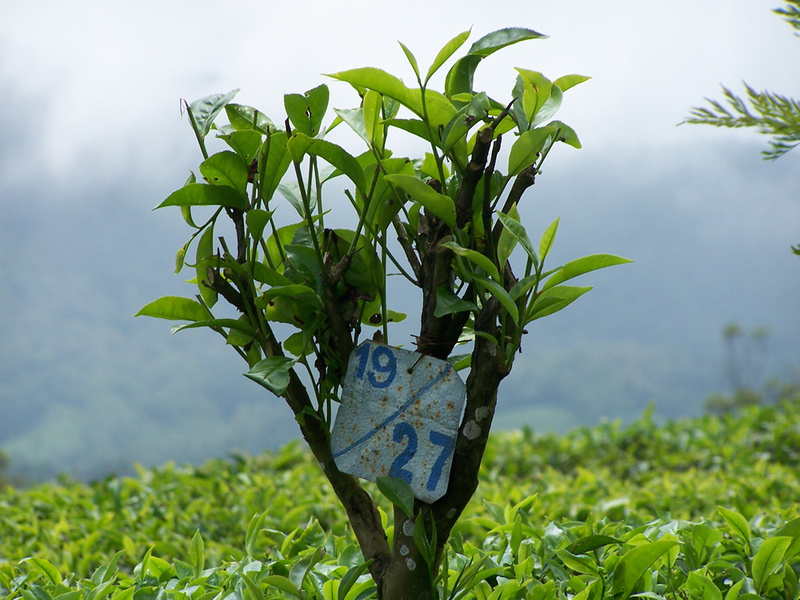 Tea leaves grow slower at high altitude where it can develop more complex flavours and better qualities. Many of the worlds most famous teas, like Darjeeling, Ceylon, or Oolong come from bushes cultivated 1000-2000 m above sea level. Whether it is green, black, Oolong, Pu Erh or white tea, they all come from the same original plant. The differences lie in the chosen plant variety, the growing conditions, the harvest and in the different processing of the leaves. For further information, please go to Tea Types & Production. The tea plant is reproduced by cuttings (a twig with one leaf and one bud). They are grown for 6-18 months (depending on location and weather) in a nursery before they can be planted into the field. The bushes need regular pruning and after 2-3 years reach a height of approximately 1 metre with a dense roof of twigs and leaves. Now the plucking can start. The tea leaves are picked between Spring and Autumn. Depending on location, weather and the cultivar the leaves can be picked every 7th - 14th day. The traditional way of plucking is to take the unopened bud and the next two tender leaves because they contain the best aroma and most health benefits.